A few years back when Red Elk’s health took a turn for the worst, I asked him to put Meachelle on the bank account that received his book sales. He did that. If you buy a book directly from these websites, Meachelle will receive the royalties directly. My favorite book is Short Stories. It is over 400 pages long but you can read a one – two page short story. It really takes you on a journey and the more times I read it the more I learn. I did make some mistakes in the book before I published it but Red Elk and his angels sure seemed anxious to get the book out into the world, so I published it after having it in my possession since 2004. There’s lots of interesting things about this book. Like how he predicted the bank failings in 2008 but I had the book in 2004! You can click on the picture to go to the CreateSpace.com directly to purchase. The second book we published was Lessons. It talks about invisibility, levitation, etc. It is a shorter book that goes right to the point on how Red Elk says you can achieve these things. The lessons are so simple they are frustrating. 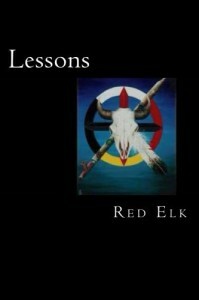 A funny story, I sent this book to a friend of mine who was serving time in prison and I told Red Elk I sent him this book. He made me promise to never send this book to a person in prison, because if they figured it out, they could escape! 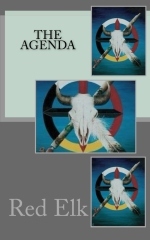 The last book we published is The Agenda. He speaks about quite a lot of controversial things. It was published years ago and lost until Adam found me a copy. It talks about wild conspiracy theories involving Draconian aliens. Another short but fun read. Another funny behind the scene story, my boyfriend was really concerned about me publishing this, but I told him, I didn’t write it, and my calling is to publish his work. Of course there is a paypal button to the right of this blog where you can donate, and all people who donate money receive a pdf. version of any book they wish (any or all). I don’t have a minimum for that. 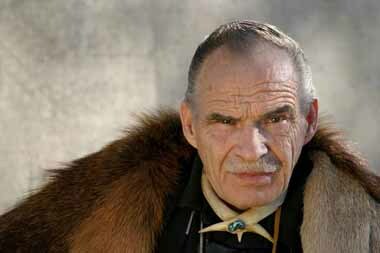 The money gets sent to Red Elk’s bank account he shares with Meachelle. The PO Box is still accessible to Meachelle. Please make checks out to: Meachelle Osborne. I have more books coming. He has a very cool handwritten children’s coloring book I was right in the middle of getting it to the specs he wanted. I’m sorry he didn’t get to see it completed. I also have all the work from the time his blog was attacked and 2/3 of his work was lost. Thanks to WS I am able to publish that work and this time I’ll put it in a book so it can’t be lost again. I have so many emails from him on how to build dome homes and things, I figure when I get time I will publish that for him and his family too. All these things will take time, but I’ll keep you posted so you know his life’s work is still going to make it out to the world. 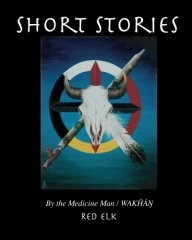 Posted on 27 June '15 by Living Documents, under Red Elk Speaks, Short Stories. That last paragraph was amusing, “Stranger things have happened around here.” ha. But I do remember in an interview that he said that he still had 2 more trips to go and that the last one will be the one where he stays there. I just heard on a reprise broadcast of Coast to Coast AM (tonight, July 6 2015, north of Toronto, Ontario) of the passing on of Red Elk. I extend my condolences to his wife and family. What an interesting individual! Creator is in for some interesting company…….. I found his work very interesting. I would listen to him on the Internet and would be totally entertained. It certainly made me think in new directions. I’m heartbroken for your loss. I hope to meet him walking with Jesus one day. I’ll certainly be buying his books.